HEAVENLY SKI CONDO - just steps away from the Aerial Tram, Cal Lodge and a World Class Skiing Experience! This light and bright ski condo has an excellent location at the base of the Heavenly ski resort. An END UNIT with plenty of open space in the front for fun in the snow. 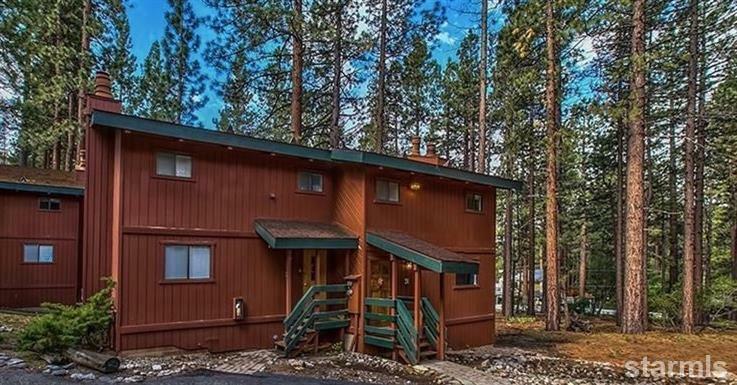 This two bedroom/two bathroom unit has high vaulted ceilings, open beams, a fireplace and a large deck overlooking the forest. The upper level includes the living room, a stone fireplace, a well-stocked kitchen, full bath and laundry. Downstairs has two bedrooms, one with the second stone fireplace and private deck. The common area features a hot tub area and guest parking. This location is ideal for year round vacation destinations. All this within 2 miles of Heavenly Village, Casinos, Ski Run Marina, shops/restaurants and the shores of Lake Tahoe.